Avoid wearing man made fibers and bring a notebook and a bottle of water with you to class. 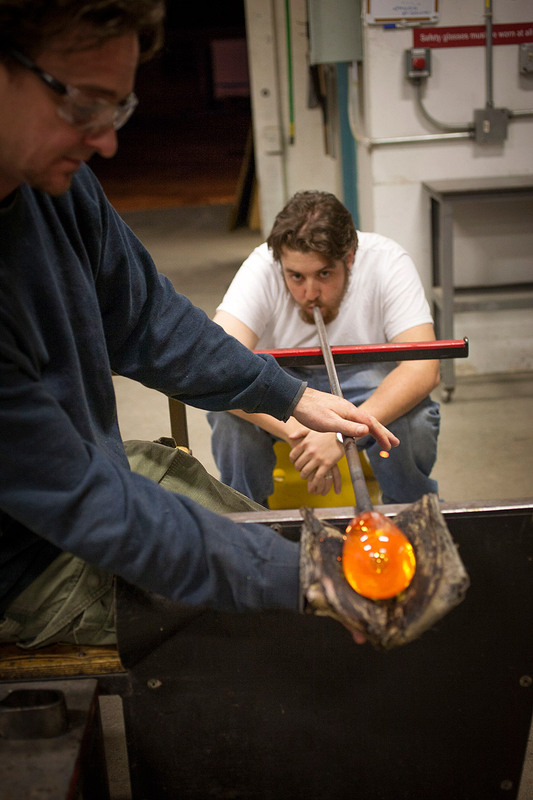 Now that you have learned the basics of working with hot glass, this intensive intermediate class will help you gain a better understanding of the glassblowing process. We will work to build knowledge and skill through demonstrations, drills, and open practice time. This class will focus on using teamwork in the studio to make more complicated and better-refined work. You will continue to develop your abilities in the Hot Shop and work toward personalizing the objects that you make. Explore historical and contemporary shapes as well as simple decorative motifs. Students must have taken at least one beginner glassblowing class or receive permission from Gale Scott, Glass Studio Department Head. All materials are included.